Dry conditions have caused the Aral Sea's eastern lobe to completely dry up for the first time in modern history. It was once the fourth largest lake in the world, but owing to a disastrous irrigation project, it's all but gone. 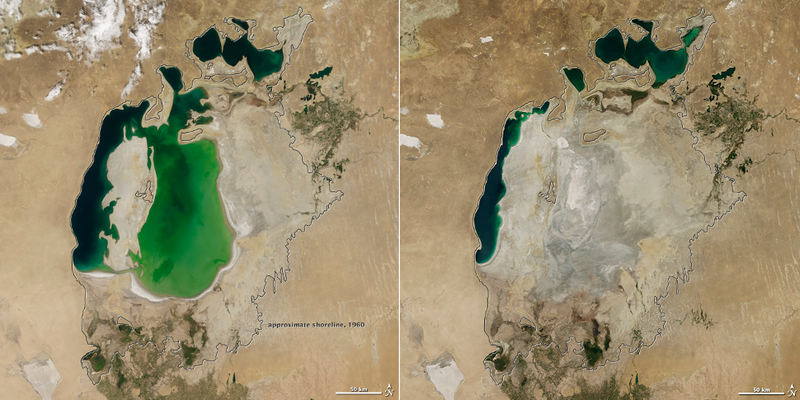 Top: The Aral Sea in 2000 (left) and 2014 (right). Back in the 1960s, the Soviet Union undertook a major water diversion project on the arid plains of Kazakhstan, Uzbekistan, and Turkmenistan. The resulting irrigation made the desert bloom, but it completely wrecked the Aral Sea. These images taken by the Moderate Resolution Imaging Spectroradiometer (MODIS) on NASA's Terra satellite documents the changes. By 2001, the southern connection had been severed, and the shallower eastern part retreated rapidly over the next several years. Especially large retreats in the eastern lobe of the Southern Sea appear to have occurred between 2005 and 2009, when drought limited and then cut off the flow of the Amu Darya. Water levels then fluctuated annually between 2009 and 2014 in alternately dry and wet years. Dry conditions in 2014 caused the Southern Sea's eastern lobe to completely dry up for the first time in modern times.